It's been awhile since I've written, since I've been busy, but there's news!! 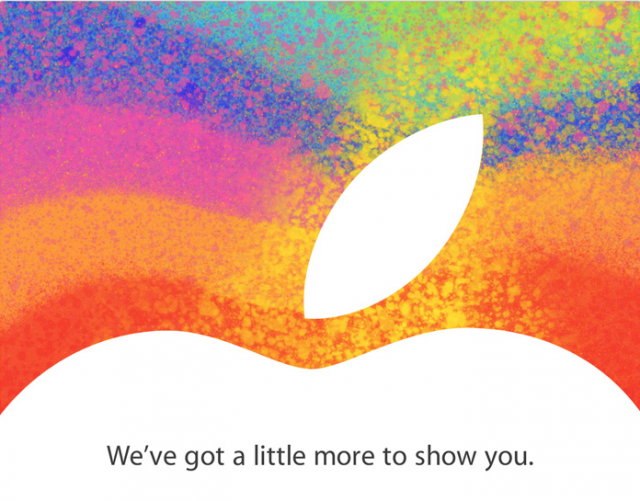 The rumors are confirmed; there is going to be an Apple event on October 23rd. Attendees began receiving invitations on Tuesday, according to iMore and Arstechnica. The tagline? "We've got a little more to show you." And interesting tagline, especially considering that all the rumors are pointing to the release of a smaller (little), 7.85" iPad. In addition, Apple is also rumored to refresh the iPad 3, with the new Lightning connector, as well as iMacs, Mac minis, 13-inch retina MacBook Pro, and the release of iTunes 11. It's looking like it will be a very interesting event. The only thing that I'm almost completely sure about: the iPad mini (or the iPad Junior, as Dan Benjamin likes to call it), and the release of iTunes 11. There's been a lot of news about the rumored iPad, dating all the way back to February 15th with an article from the Wall Street Journal. Over the course of the last few months, there have been so many rumors about the smaller iPad that it lends quite a bit of credibility to the existence of such a device. iTunes 11 was previewed at the iPhone 5 event, and the release date? October. It would make sense that iTunes 11 would be released this next Tuesday along with the iPad mini. We'll just have to wait to see then!